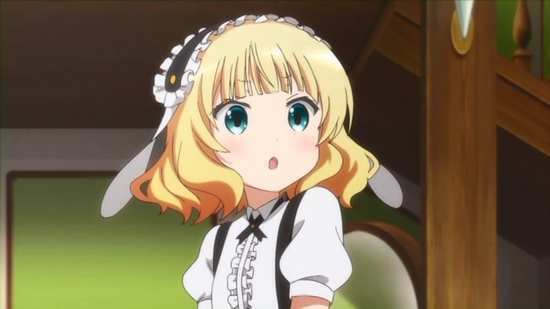 There is such a thing as too cute, as I discovered when I reviewed yet another ‘cute girls doing cute things’ series recently. Is The Order a Rabbit? tried a little too hard in my opinion, and the slice of life antics just didn’t feel as effortless as they should in a show whose primary purpose is to help the viewer relax. But what do I know? I’m now taking a look at the second season (distinguished by a second question mark in the title), and a third season is in production in Japan. 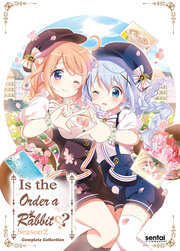 There’s a lot of love for Is the Order a Rabbit?, Is the Order a Rabbit? ?, and I assume Is the Order a Rabbit??? Let’s see if I have more fun with this second season than I had with the first. 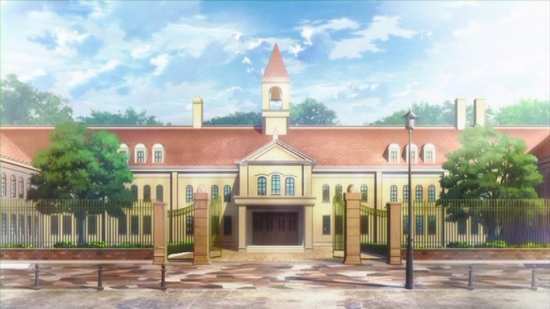 Cocoa Hoto is transferring to a new school and moving to a whole new town in the process. It’s a picturesque, European style setting where rabbits run wild. Speaking of rabbits, she gets lost on her first day, and pops into an inviting cafe called The Rabbit House to rest and get her bearings. It’s pure coincidence that she’s actually found the place where she’ll be living. 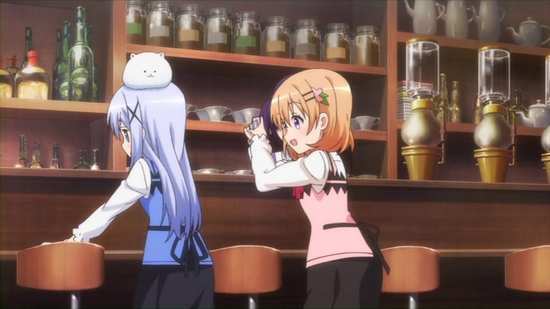 The Rabbit House cafe is usually run by Chino Kafuu, a young girl who usually has a talking Angora rabbit named Tippy on her head. 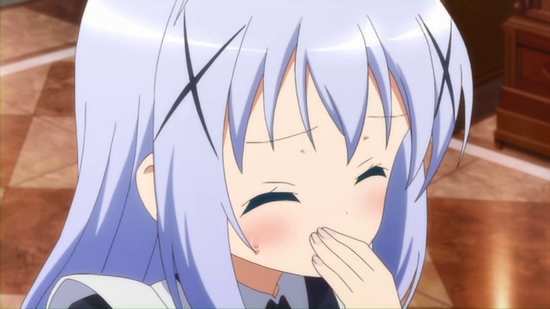 Cocoa will work in the cafe in exchange for room and board, and seeing the adorable but shy Chino, she decides to be her older sister as well, whether Chino wants it or not. 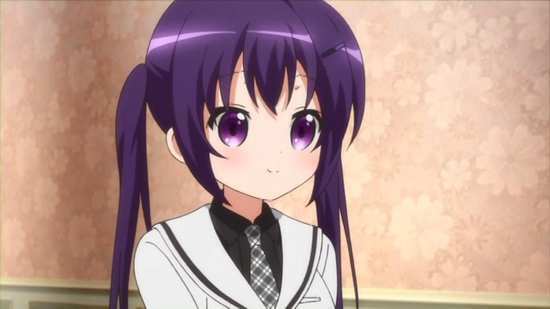 Another waitress in the cafe is Rize, daughter of a military family and skilled in combat techniques. 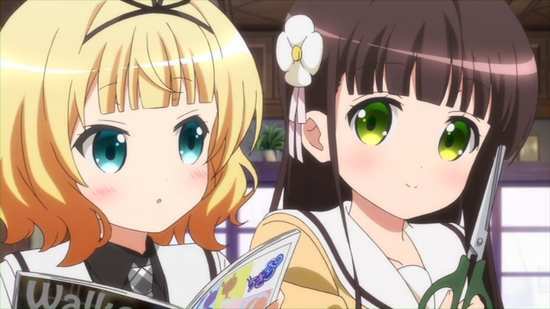 As Cocoa gets to know her new home she also meets waitresses from rival cafes, Chiya, who has a passion for Japanese confectionary, and Syaro a hard-up girl who has to conceal her poverty as everyone thinks she’s a high society princess type. 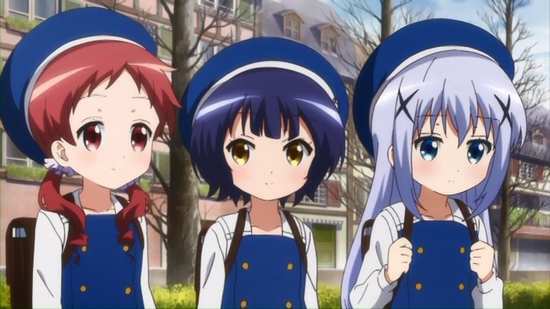 Is The Order a Rabbit? gets a 1.78:1 anamorphic NTSC transfer, progressively encoded on these discs. The image is as good as DVD anime gets, clear and sharp throughout, smooth animation, with a minimum of compression, aliasing or banding. The characters follow the usual ‘cute’ aesthetic, with a little infantilism assigned to the designs. The real beauty of the show comes in the location and world design, the European style town with its historic streets and arcades all looking very pleasant and enticing. 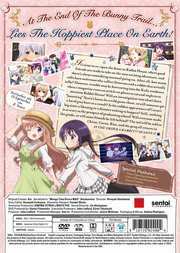 You get a DD 2.0 Stereo Japanese track with player locked English subtitles. The dialogue is clear, and the subtitles are accurately timed and free of typos. The show’s a dialogue heavy, light comedy piece, so it doesn’t exactly set the soundstage alight, while the cast of cute girls get just the sort of voice actor performances that you’d expect. The incidental music suits the faux-European setting well, with plenty of accordion thrown in. The theme songs are oxymorons, in that that they are catchy and forgettable at the same time. You get three discs in an Amaray case, with two on a central hinged panel. The discs present their content with static menus and jacket pictures. Disc 1 has trailers for Gatchaman II, Gatchaman Fighter, My Love Story! !, and Hello!! Kinmoza!. You also get the textless opening, and 4 textless closings. Disc 2 offers 4 more textless closings. Finally on Disc 3 there are 2 textless closings. Ditto. Same again. More of the same. All the tiresome clichés that make writing this review a bit of a chore. 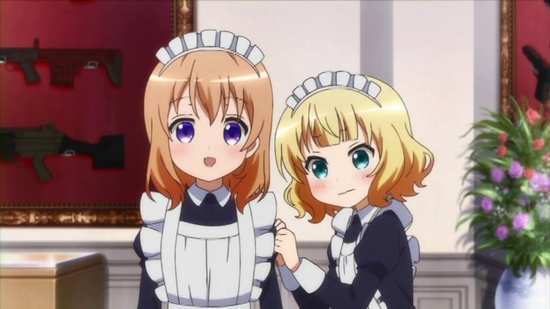 If you watched season 1 of Is the Order a Rabbit, and wanted more like it, then season 2 is just what you need, as it features the same characters, more cute girls doing cute things with cute rabbits on their cute heads. Excuse the pun, but you will be a happy bunny if you get the second season. But for me, who enjoyed the first season to a degree, but not without the niggling suspicion that all wasn’t right, I know have to go through the same process of justifying my ‘like’ for the series, while trying to understand why it isn’t ‘love’. 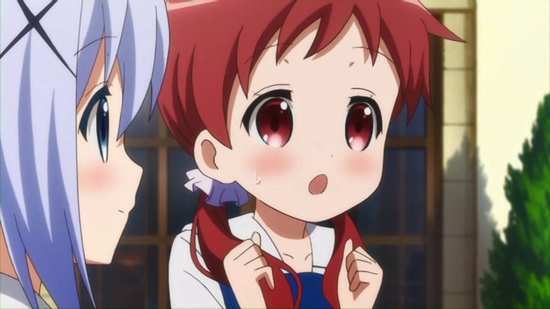 After all, slice of life cuteness is my genre of choice, the sort of anime that I can aggressively relax to. It’s usually better than any massage for easing tension, only this series doesn’t quite work out all the knots in shoulders, doesn’t loosen up my spine the way something like K-On or Non Non Biyori can do. The girls return, with the outgoing Cocoa still determinedly expressing her big sister credentials on the cute and shy Chino, Syaro having lost some of her uniqueness now that everyone knows her true financial status, Chiya still being oddball, and the militant Rize still revealing unexpected cute weaknesses. 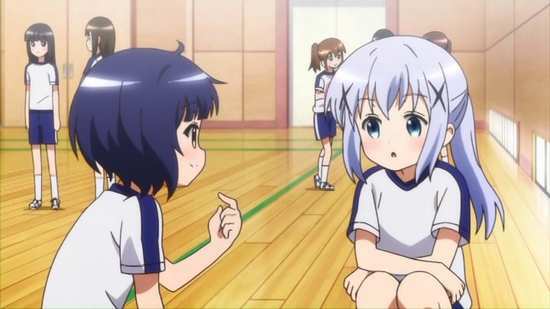 We also get to see more of Chino’s friends Megu and Maya this time around, and the seven girls get up to all manner of good natured fun. 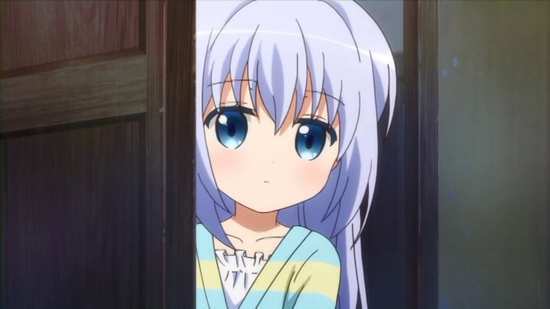 If there is an arc to the series, it’s that of Chino coming out of her introverted shell and becoming more outgoing. In these episodes, the girls take photos of each other, tell each other ghost stories, take ballet lessons. Cocoa’s big sister visits, which throws her own ‘big sister’ equilibrium out of whack, they have a laundry day, they stalk each other, go on vacation to the great outdoors, and even try geocaching. It’s all, fun, inconsequential triviality, and were it any other show, any other cast, I would adore its playful nonsense. Yet there is something about Is The Order a Rabbit which just doesn’t click with me. Once again, I have to say it’s the characters. The creators are simply trying too hard to create characters that click with the target audience. In terms of character design, in terms of voice actor performances, in terms of how they behave, they’re just painfully obvious about what they are trying to achieve. None of these slice of life characters are ever realistic, but in shows like K-On and Azumanga Daioh, you’d wish that they were. You’d want that kind of cuteness in the real world. If I saw any of the Is The Order a Rabbit characters in the real world, I’d want to get them psychological help. The sequel is just as watchable, and just as disposable as the first season.